Hearty cuisine and the Internet are the things at The Healthy Hog. Source: 5News video. Until a TV report aired yesterday, Clarksville residents may not have known that Ponzi history has touched their town of fewer than 10,000 residents in a big way. The Johnson County community is known for its scenic beauty and annual Peach Festival. 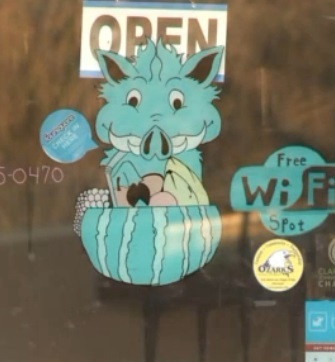 5News (KFSM-TV in Fort Smith and KXNW-TV in Fayetteville) sent a crew to The Healthy Hog after Wright-Olivares was charged criminally and civilly in the Zeek Rewards Ponzi-scheme case in December 2013. Zeek, the SEC says, gathered at least $850 million. Wright-Olivares appears to have parachuted into Lexington, N.C., from time to time as part of her role as Zeek’s onetime marketing maven. Kenneth D. Bell, the court-appointed receiver in the civil case and the special master in the criminal case, has noted that Zeek operated from Lexington and drew in participants from at least 100 countries around the globe. In terms of the number of victims and the creation of net losers (an estimated 800,000), the Internet-driven Zeek scheme may be the largest Ponzi scheme in U.S. history. By comparison, the 2008 AdSurfDaily Ponzi scheme — at the time considered the largest Internet-based Ponzi scheme in U.S. history — affected about 100,000 people and gathered about $120 million. Wright-Olivares, 45, was Zeek’s former COO. She has settled the SEC civil case against her and agreed to plead guilty to Zeek-related criminal charges of investment-fraud conspiracy and tax-fraud conspiracy, federal investigators said. Her stepson, Daniel Olivares, 31, also has settled the SEC’s civil allegations and agreed to plead guilty to a criminal charge. In Daniel’s case, it’s a charge of investment-fraud conspiracy. The criminal charges were the first in the long-running Zeek probe, which became public in August 2012 and also involves the U.S. Secret Service, the IRS and the office of U.S. Attorney Anne M. Tompkins of the Western District of North Carolina. The SEC filed its first Zeek-related civil case on Aug. 17, 2012, naming Zeek operator Paul R. Burks of Rex Venture Group LLC a defendant. Bell has identified Alexandre “Alex” De Brantes, the husband of Wright-Olivares, as member of a group of alleged Zeek insiders. Images of De Brantes appear briefly in the 5News report. Bell is expected to file lawsuits against alleged Zeek insiders and “net winners” soon. Good thing it’s not called ‘The Wealthy Hog’.